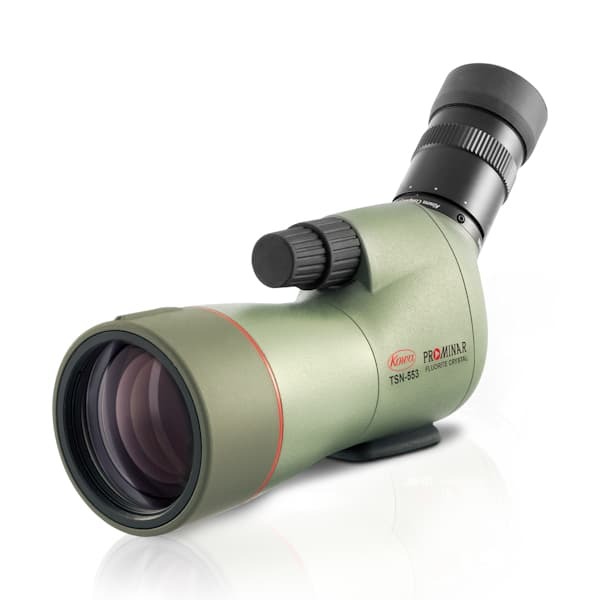 Kowa TSN-553 15-45x55 Prominar Angled Spotting Scopes are the first scopes with objectives smaller than 88mm to have pure fluorite crystal objectives. Finally, you can carry a top level scope that weighs less than 2 pounds (28.5 oz.) on a long trek. Fluorite crystal enables the virtual elimination of chromatic aberration, resulting in astoundingly increased resolution and contrast. The TSN-553's fluorite crystal objective lens is fully multi-coated, plus Kowa's KR water- and scratch-resistant coating, and is housed in a polycarbonate body, complete with a permanent 15-45x zoom eyepiece. Close focus is 9.8', achieved with smooth dual focus knobs for fast or fine focus. Maximum field of view is 132'. Eye relief is a generous 16.5mm at 15x and 16mm at 45x, so eyeglass users should have no problem. Field of View: 132 - 69 ft. at 1000 yds. Product Weight (oz): 28.5 oz. Dimensions: 10.6 x 6 x 2.6 in.